This is a strange one. To be fair, I only just made them (in the dark last night and this AM) and we haven’t had much chance to really see how they perform in daily use, but certainly for the iPhone case I have no reason to believe they won’t withstand reasonable use – only time will tell. But the real beauty is that they are fairly quick to make, cheap, and if it gets wrecked you can quickly and easily make another or simply revert to your shiny plain back. Fair warning – LOTS of photos! 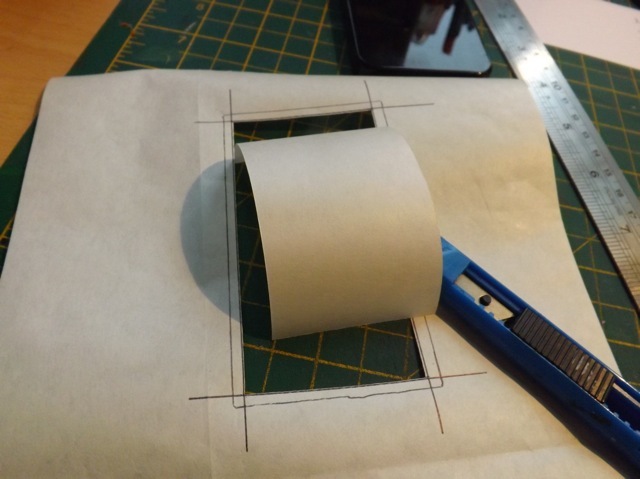 a piece of contact paper (packing tape is not wide enough!) 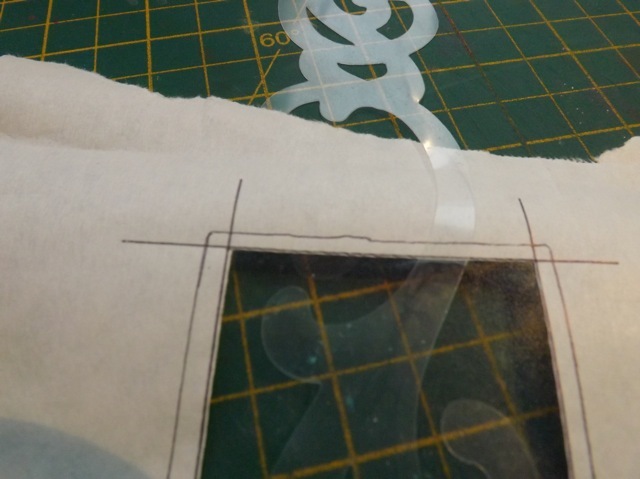 I used clear contact paper but I wonder about using one with a pattern? 1. Measure out the area on the paper side of the freezer paper. Draw lines just inside these lines (about 1/8 inch) measuring from the INSIDE of the line. Better it be slightly smaller than too big. Cut out the centre with a craft knife. Now you will have the STICKY side of the contact paper (stuck in place to the shiny side of the freezer paper) showing thru the PAPER side of the freezer paper. 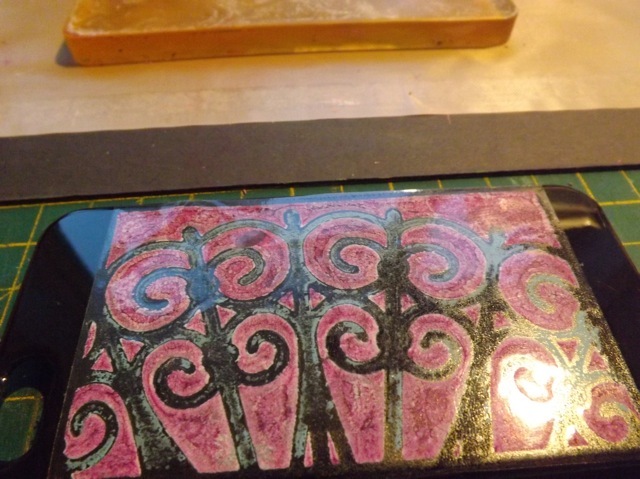 This means the extra paint on the Gelli plate has someplace friendly to go (the surrounding paper back of the freezer paper) when you pull your print onto the sticky window and the contact paper will easily peel off the shiny side. It should be a plastic mask rather than paper. I did use paper but the paper will stick harder to the contact paper, sometimes ripping and leaving little hazy shreds stuck to it. You should be able to faintly see the bits of white at the far left in the vine, and on a couple of the larger leaves. It’s not massively annoying but it could be…. 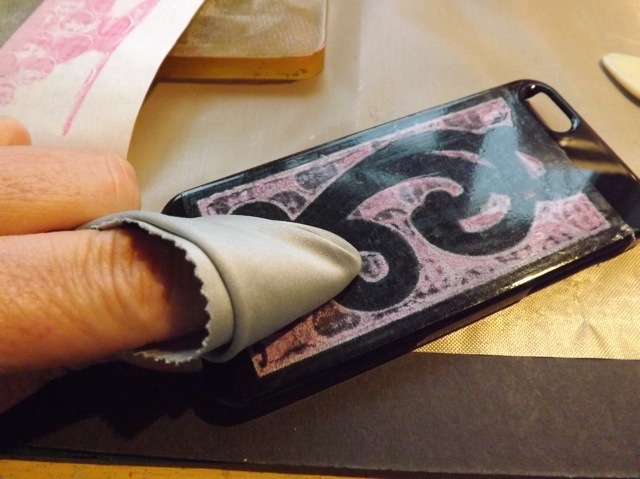 The paint-covered contact paper will NOT stick to the phone cover. 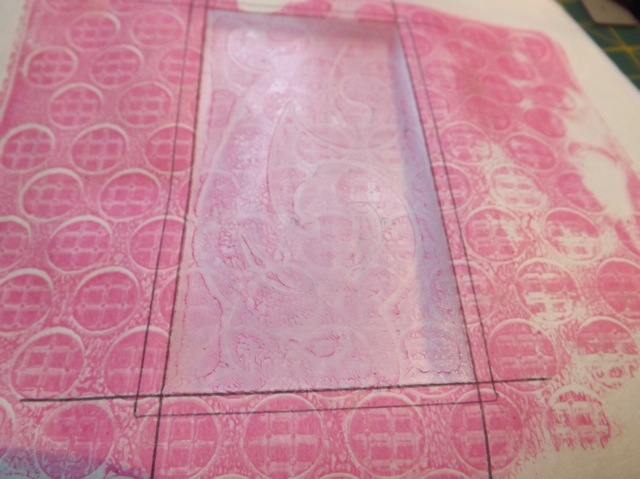 Make sure there is enough masked area so that, combined with the thin edges surrounding the print, it WILL stick to the phone cover. Make sure your mask is clean! If the mask has any paint on it, that paint will transfer to the contact paper and keep it from good adhesion. It may not be a problem for you if it is only stuck at the sides but you will end up with air bubbles under the middle if you don’t get the sides stuck ABSOLUTELY perfectly flat. That mask was well covered with blue paint. 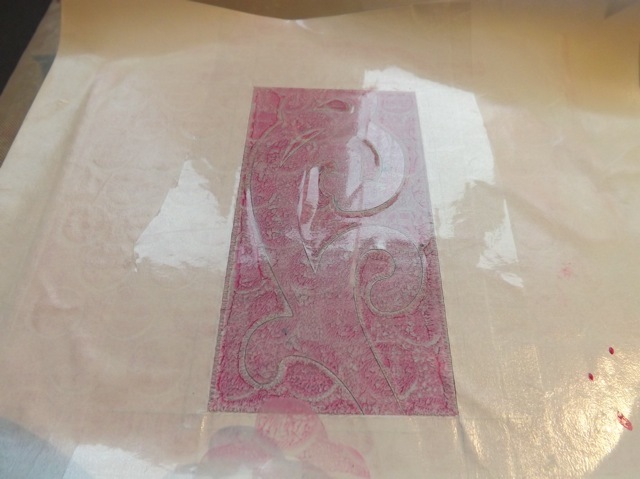 You can clearly see how it transferred to the contact paper. I do like how it looks, and it certainly seemed to stick well enough because the paint from the mask was patchy and there were still bare areas. 4. Stick your chosen mask to the contact paper inside the window. Can you see how my mask is tucked away at the top? Placing it, there was just a bit of the that hung down into the window and I didn’t want that masking the print. 5. 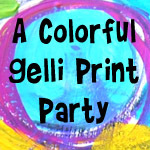 Do your paint design on the Gelli plate. Not too much paint, and a fairly simple design. 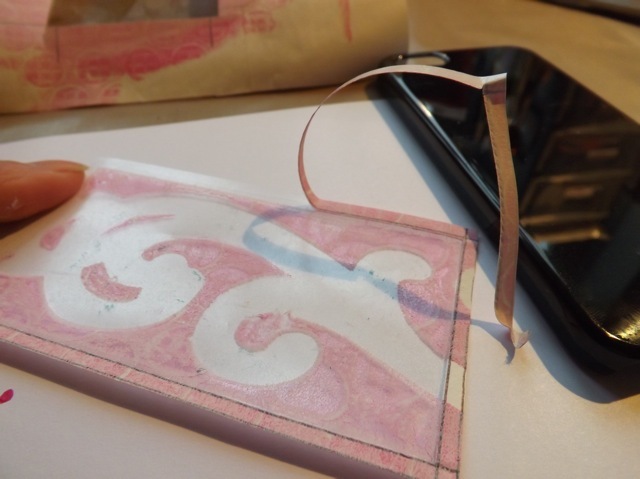 Pull the print onto the sticky side of the contact paper. Keep in mind the colour of the cover. I have a black one. Light paint looks muddy, dark paint sort of disappears. It will be different on say a WHITE cover. 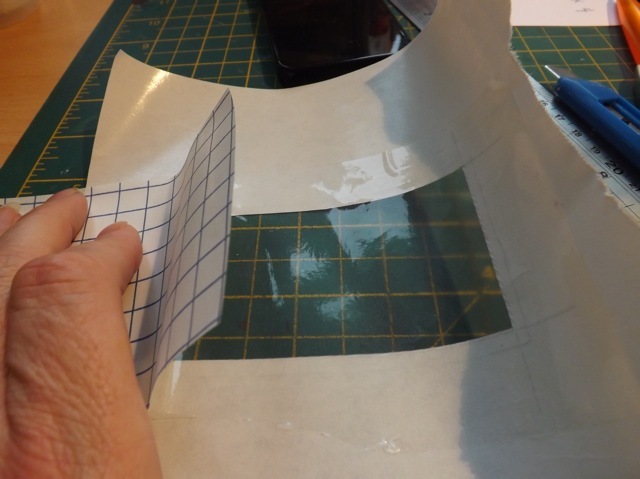 You can pull a few packing tape prints and when dry, hold them over the cover you have to check how they look before going to the trouble of doing the contact paper version. I’ll show you what I did to solve the problem in a second. You can see the design better on the freezer paper surround at this point. 6. 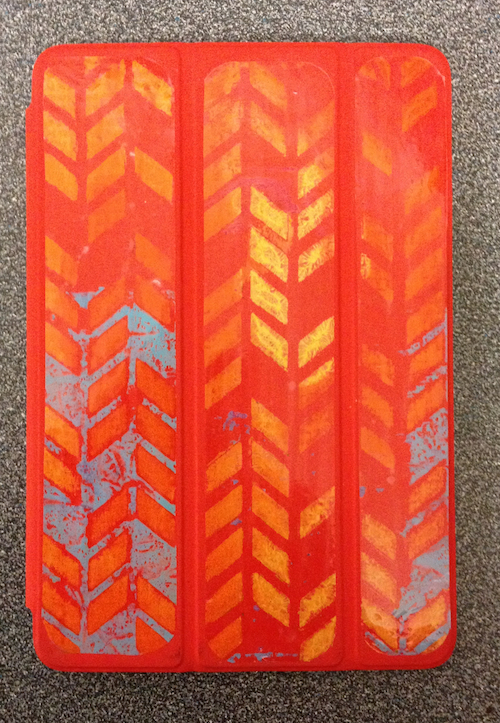 Pull a thin layer of white paint behind the colour layer. 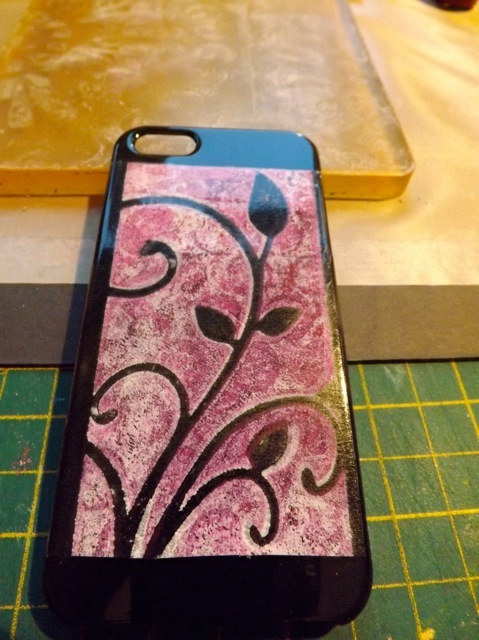 This will “back” the colour and keep the phone cover colour from showing thru quite so strong. 7. LET IT TOTALLY DRY. Peel off the mask. Trim away along the OUTER lines on the freezer paper. This will leave you with your contact paper window and a thin edge of freezer paper stuck to the frame. Can you see that although my mask was pretty clean, the tiniest bit of blue paint transferred to the contact paper? That stuff grips everything! Can you see the frame of paper? This paper should peel away very easily as it is stuck to the shiny side of the freezer paper. 8. Carefully stick the piece to the phone cover. You can re-position easily – it will cling but not stick. Once you are happy with your positioning, burnish it down. You can do this with a bone folder or the back of your fingernail, and if you cover either with something like an eye-glass cleaning cloth you will minimize the lines you can see in the open areas. This is just the beginning of my experiments, using stuff I had. I have a stencil in mind that I think would be PERFECT for this, but I need to buy it. I can also think of two I cut on the Cricut that I would love to try but the ones I’ve already cut are too big, so I would need to cut them again but smaller. There is a lot of playing to be done with colour and pattern, to maybe devise some rules about what works best from an adhesion POV. What about gilding flakes or metallic paint?? As you can see from the photos I made three different ones. They peel off absolutely cleanly from the cover, and what’s more, I was able to stick them to the scrap of release paper the contact paper came off of, and was able to re-attach them. So maybe you could make a whole little wardrobe of cover stickers and change them at will. The tricky part is keeping the corner where you start to peel-back from getting totally ragged, but with care it’s not too bad. And now a bonus shot. As I was playing with this, DH wandered past and said Well that’s nice but when are you going to do my iPad mini cover?? You may recall I did his iPads (one stamped with Staz-on, one doodled with Sharpies) but I’ve not had a go on his mini iPad cover yet. So I did. For that, I found the packing tape was the perfect size. 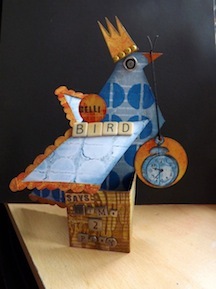 It was all a bit experimental, so the sizing isn’t perfect on those rounded raised panels, and again my stencil was so mucky it all transferred to the tape. But even so, the packing tape DOES stick well enough to the cover material. I’ll know later today how well it sticks as his iPads get a lot of use, getting tossed in his backpack and briefcase, tossed on the desk and counter, propped up by the side of his chair…if it stays stuck thru all that, I’m thinking it’ll stay stuck unless it gets dropped in a puddle or caught out in the rain. He isn’t convinced that the contrast of the shiny tape over the matte cover material is ideal – certainly better cutting of the tape so it covers the entire raised panel, leaving only the thin grooves between then matte, will help A LOT, but even so, I think it looks pretty cool…. Again the tape peels off easily once you get it started, we could see no transfer of paint to the cover (granted, only a short time installed – maybe tomorrow, after say 48 hours, it’ll be different?) and it seems pretty well stuck. Tempted? If you have a go let me see the results. 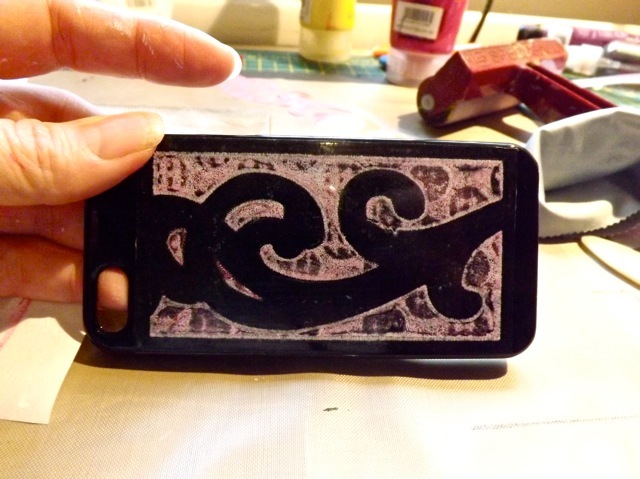 Categories: Gelli plate monoprints, tutorial | Tags: Gelli plate, iPad cases, iPhone | Permalink. 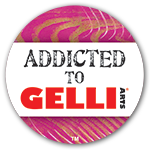 Now you’re taking Gelli play with you everywhere you go! So cool! So glad you shared this with the party!